With The White Card, Claudia Rankine turns to the stage. “What can I do for you? How can I help you?” These sound like kindhearted questions, the sort you’d be glad to hear if, say, you were trying to wrangle a stroller up the subway stairs. They’d be just as welcome if you were making a donations pitch for the nonprofit theater you run, and perhaps most profoundly appreciated if you had put out an urgent call for a matching bone-marrow donor. Different as they are, these offers of assistance involve an individual exchange: a specific need met by someone with the wherewithal to address it. This encounter prompted Rankine to write a play, The White Card. “I really wanted to have the conversation he started,” she writes in the preface to the script, which has recently been published by Graywolf Press. But because the man, and others like him, seemed to expect “the performance of something I as a black woman cannot see even as I object to its presence,” Rankine wonders if “the only way to explore this known and yet invisible dynamic is to get in a room and act it out.” That room turned out to be in Boston, where ArtsEmerson and the American Repertory Theater jointly produced The White Card last spring. 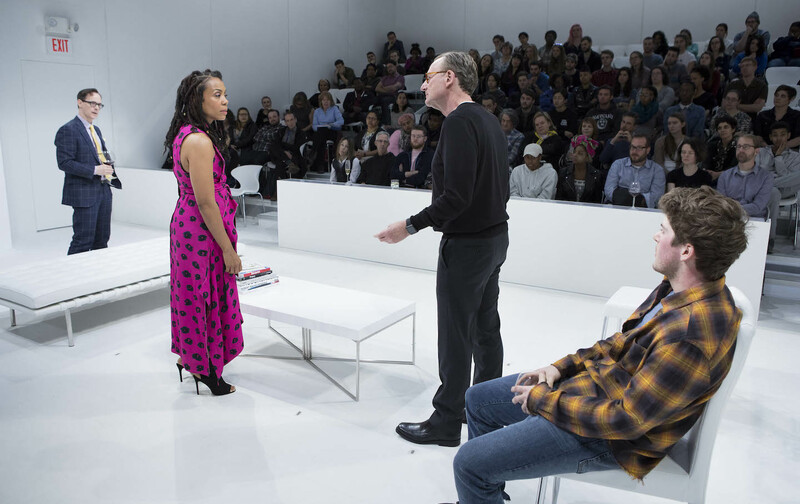 In two taut acts, the play traces an escalating confrontation between a black artist, Charlotte Cummings, and a wealthy white art collector, Charles Spencer, as it considers the meaning of making, buying, and beholding images of black death. Even if Rankine had not endured that exchange at the Q&A, her work seemed likely to head in a theatrical direction. Her most recent books, Don’t Let Me Be Lonely (2004) and Citizen (2014), invite an engagement that goes beyond reading. Both juxtapose language with images—color reproductions of news photos and artworks in Citizen, a variety of black-and-white photos and drawings along with a recurring picture of a static-filled TV screen in Lonely. Citizen, especially, is as much an art object as it is a volume of essays and poetry. Its gorgeously designed, glossy white pages perform one of the work’s essential, dialectical gestures: Their slick beauty seduces the reader even as their glint repels the eye. Similarly, we are drawn in by the frankness and smoldering emotion of Rankine’s writing, even as we can’t bear the accreting acts of racist insults and violence—from personal slights to state-sponsored deaths—that she inventories. Both books concern themselves with the theater’s primary material: the spectacle of human bodies. In words and pictures, Lonely invokes blood, organs, cancer, sweat, medications, and bodily functions in its raw contemplation of the physical and emotional dissociation that a media-drenched world imposes. Citizen reveals the psychic impact of racism on and through bodies, specifically black bodies—whether those of Serena Williams, James Byrd, Trayvon Martin, or Rankine herself—and the ways they are seen and not seen, rendered invisible and hypervisible, on the stages of public space and the mass media. In Citizen, Rankine goes further, abandoning the “I” altogether and writing in the second person, as if anyone who picks up the book can meld into the “you” facing what she calls “the quotidian struggles against dehumanization every brown or black person lives simply because of color.” It’s a generous move: to assume that any reader—even those of us not brown or black—can make that leap of identification. At the same time, it’s an unsettling one, since it forces us to ask: Can I really be that person in any of the vignettes of casual racism that Rankine recounts? And if not, am I cast as the aggressor in the scene? Either way, every reader must repeatedly reflect on, and play, a role. Rankine used a similar strategy in one of her first forays into live performance, The Provenance of Beauty (2009). Commissioned and produced by New York’s Foundry Theatre and co-created by the director Melanie Joseph, Provenance was performed on a bus cruising through the gentrifying South Bronx for an audience of passengers. Through individual headphones, we heard Rankine’s poetic text delivered by actors—some of it recorded, some of it live—as if whispered intimately to each of us. It was an experience both singular and collective, a performance both in the Bronx (where Rankine grew up) and separated from it by the cold steel and glass of our vehicle. Pointing out the sights we passed—conjuring old cultural landmarks in repurposed buildings or shiny new ones—one voice spoke as the Bronx itself, while the others addressed us in the second person, placing us in the landscape that we traversed. As with Lonely and Citizen, the piece called on our critical imagination: We were enjoined to envision ourselves in the places beyond the bus windows—and to ruminate on the tangible limits of our empathy. Poetry married performance in this innovative piece, taking its audience on a journey both material and metaphorical. In contrast, The White Card is a work of narrative dramatic realism, whose characters speak for themselves in language that is not poetically heightened but strives to sound like everyday speech. Linear where Rankine’s earlier works were elliptical and recursive, stylistically tame where the others were formally adventuresome, the play addresses timely questions of representation, appropriation, cultural ownership, and dirty money in the art world. It makes references—sometimes direct, sometimes oblique—to recent related controversies: the display of Dana Schutz’s painting of Emmett Till in 2017’s Whitney Biennial; Kenneth Goldsmith’s delivery of Michael Brown’s autopsy report as a found poem; the funding of art museums by the likes of the opioid-peddling Sacklers or the manufacturer of the tear gas fired at migrant mothers and children at the San Diego–Tijuana border, among others. Rankine knows her way around these issues better than anyone, and the ideas discussed in The White Card are always compelling, even if the discussants at times seem more like talking heads than characters with whom an audience can become emotionally involved. In the first act, Charlotte is a dinner guest at the home of the Spencers: Charles (a well-intentioned exemplar of the “white-savior industrial complex”), his wife Virginia (long-suffering and preoccupied with propriety), and their son Alex (a more-woke-than-thou Showing Up for Racial Justice activist and college student, fresh from an anti-Trump protest), along with their calculating art dealer, Eric. Charles collects work that he deems supportive of the black cause—including a newly acquired piece he will unveil that evening. As the dinner wears on, the hosts’ clueless, hurtful remarks (some of them familiar from Citizen) leak into the polite conversation like a toxic drip. Discussing tennis, Virginia comments that Serena Williams’s decision to return to Indian Wells (where she’d been subjected to racist vitriol earlier in her career) showed that she had “really matured”; when Charlotte moves to help clear the table, Virginia tells her, “Sit down. You’re not the maid.” Virginia refers to the black painters and sculptors whose work her husband purchases as his “stable” of artists; she also misremembers the name of Ta-Nehisi Coates’s book as “The World Between Us,” while Eric mispronounces his name. Suggesting that Charles invite Charlotte onto the board of his foundation, Eric notes that adding her “will definitely solve the diversity issue.” And Charles makes self-righteous claims about the works he collects—one “critiques fascism,” another “gestures toward structural racism”—that he has no idea how to back up when Charlotte presses him to explain. The hypocrisies, microagressions, and family squabbles come to a head after dessert—“Hazelnut cake with whipped cream and strawberries, and fruit salad for the virtuous among us,” Virginia announces as she brings it to the table—when Charles unveils his latest acquisition. To Alex’s and Charlotte’s horror, it turns out to be a sculpture representing the autopsy report on Michael Brown. “We are not going to get anywhere with this kind of…this kind of American sentimentality,” Charlotte tells Charles when he defends the work as a “portal to inhumanity.” Then, in one of the play’s few wholly theatrical actions, Charlotte lies down in front of the mantel on which the sculpture sits; she is filling in for Brown’s erased body. Meanwhile, the Spencers bicker with one another, hurling recriminations about their various familial failings. Once they finally notice Charlotte sprawled out on the floor, the first act comes to an end. Like the Vices in a medieval play, the characters in Rankine’s drama have significant names: Charlotte, Charles, Virginia. They recall the locales where one white supremacist drove his car into a crowd of protesters, killing Heather Heyer, and where another massacred nine black churchgoers (to mention only two recent, heinous hate crimes). And as in those old morality plays, each character personifies something—in the case of The White Card, a position in the debates about racial justice, capitalism, and representation. While the language is sometimes declarative and didactic—far more so than in Rankine’s lyrics, where she seldom declaims—I imagine that in performance, there’s one way that the play acquires a dramatic action beyond the plotting on the page. In Citizen, as Rankine catalogs a series noxious encounters, she repeats a refrain: “What did he just say? Did she really say that?” In The White Card, she deftly supplies the audience with opportunities to do some similar double-takes, to be taken aback by the unconscious affronts that the white folks routinely deliver, many of them involving sexism as much as racism. “She doesn’t have children, so the work is everything to her,” Eric tells Charles about Charlotte. When Alex enters and is introduced to Charlotte for the first time, he embraces her. No doubt, the audience spends a lot of the show cringing. But whether white spectators—the vast majority of American theatergoers—congratulate themselves for their moral wincing or recognize themselves as colluding in the structures of white supremacy is hard to say. What’s more, that Charles has made his fortune in part by building private prisons may let audiences slide even more easily off the hook—few are likely to be one-percenters or prison profiteers and thus can distance themselves from this well-meaning but clumsy and culpable man of privilege. Césaire could be speaking for Charlotte, who becomes equally suspicious of spectators who might take the grief inherent to her art as mere entertainment. In the short second act, Charles visits her in her studio a year after the dinner party. Charlotte explains how an evening that ended in disaster—the last time they’d seen each other—had also proved revelatory to her. She could now understand how Charles’s collection of works depicting black victimization, as well as his gaze, his eagerness to offer help from an unexamined position as savior, all pointed to the way that he was “locked into your imagination of blackness.” In that regard, she continues, she thinks he resembles the officer who shot Michael Brown: “His obsession with black people as criminals and yours with black people as victims are cut from the same cloth. Neither is human.” And she also realized that her own photographs of restaged scenes of racist violence, which Charles was so eager to buy, delivered—to borrow the slogan on Parker Bright’s T-shirt as he protested Schutz’s Emmett Till painting at the Whitney—“black death spectacle.” She will no longer have any part in it. Thematically, Césaire could be speaking for Rankine, too, who shows the problem with making black suffering into a dancing-bear amusement. But at the same time, The White Card is, after all, a play, a spectacle by definition. The challenge, then, is to engage audiences in ways that don’t leave them as onlookers who are “sterile,” in both senses of the word that Césaire invokes: protected enough from the horrors that the play depicts to be unaffected by them, and barren of productive responses to them. Lonely and Citizen involve and implicate readers in complex ways, shifting the terms of address and interrupting language with images that complicate rather than illustrate what the words say: They call for readers to puzzle and to ponder. With its schematic characterizations and tight grip on the conventions of naturalism, The White Card has a tougher time granting us such stakes in meaning-making. Theater is an art form of double consciousness—we see, simultaneously, character and actor, setting and scenery, representation and reality. Drawing attention to this trait by breaking the illusions that it constructs, or at least showing their fault lines, has proved a powerful means by which theater has probed social constructions and the forces that erect and sustain them, such as race and white supremacy. 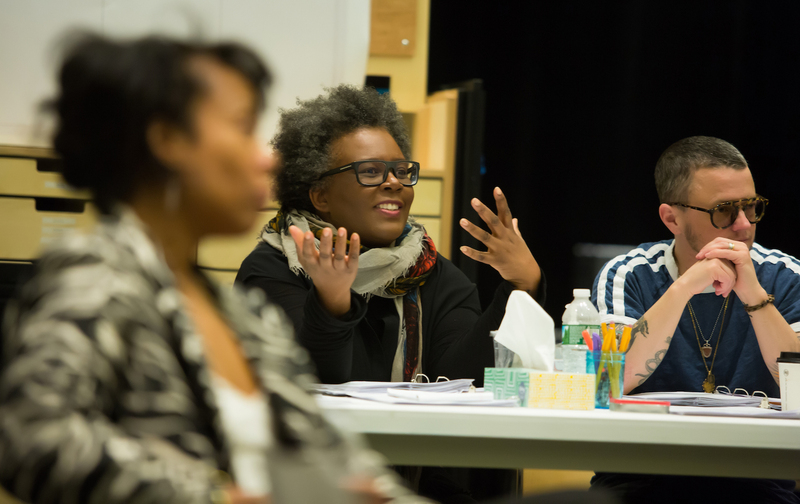 Wishing not only to tell audiences how to unpack these categories, but to give them an experience of doing so, playwrights have long written works that point to—and upend—their own illusionistic devices. There have been several this season alone: Jackie Sibblies Drury’s Fairview, Jeremy O. Harris’s Slave Play, Young Jean Lee’s Straight White Men, and the revival of Lynn Nottage’s By the Way, Meet Vera Stark. But Rankine chooses to keep the four walls intact and to place the audience within them. 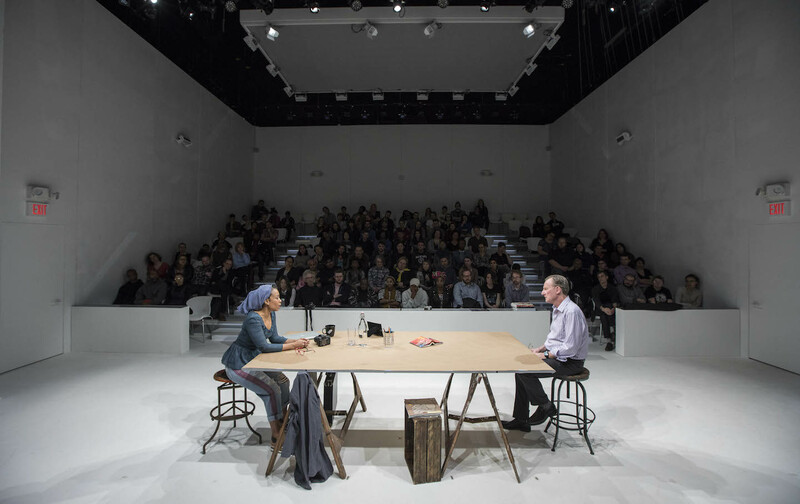 Her stage directions call for the seating to surround the dinner party, “to enable audience members to also be looking at each other.” In Boston, by all reports, the designer Riccardo Hernandez constructed a sealed, shiny white box that contained audience and actors alike, with spectators seated on opposite sides of a long playing space, as at a tennis match: confined and on mutual display. Perhaps this arrangement aims to turn the tables on double consciousness in the sense that the term was originally used—what W.E.B. Du Bois famously described as the experience of African Americans: “this sense of always looking at one’s self through the eyes of others, of measuring one’s soul by the tape of a world that looks on in amused contempt and pity.” Putting white audiences in this position should encourage their self-scrutiny. But set design cannot do the work that dramatic action does not accomplish; the possible discomfort of being seen by spectators on the other side of the theater does not, in itself, carry critical content. That’s why readers of The White Card—as opposed to its viewers—aren’t likely to miss out on a crucial element of the experience. Either way, one encounters a closed world in which the lines of an urgent debate are clearly and thoroughly drawn, a world that leaves none of the openings that Lonely, Citizen, and Provenance challenged us to enter. At play’s end, Charlotte explains to Charles that she has decided to create work that provokes viewers to look “at your own whiteness”—and, at least to some degree, Charles comes around to supporting that effort. I hope that the man who offered his assistance to Rankine at her reading could be moved by this play to do the same.